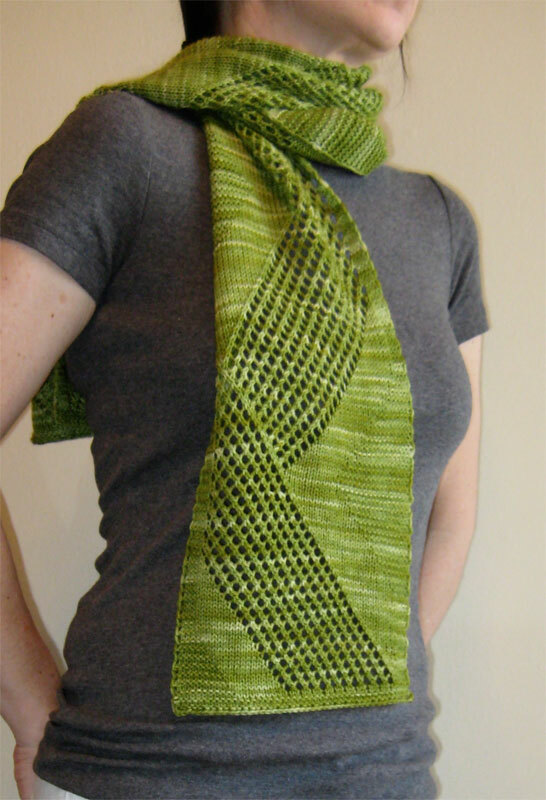 The pattern is a lacy, graphic scarf called Zigzag Wanderer knit in super yummy Malabrigo sock. I’m so thrilled to be part of the launch of such a beautiful new publication. The editor, Janel Laidman, and her spectacular team have done a fantastic job of not only presenting such a great collection of patterns but the photography and styling are stunning as well. Magical! So if you like socks and/or sock yarn then get your yarny self over to The Sock Report and check out the glory of all that is sock yarn related! Thanks so much Susan! I took a look at your blog and you’ve got some fantastic patterns yourself. Especially love that Pinkerton shawl! Hi I just bought The Sock Report and loved your scarf pattern right away. I am going to cast on for it this week. I would like to make it wider if possible but can’t seem to figure out how or where to add in stitches. Is it possible to do with this pattern? Thanks so much for your interest in my pattern! How much wider would you like to make it? If just an inch or two, you could try playing around with the gauge and using a bigger needle and/or adding a few stitches to the garter border. Unfortunately, this type of design is a bit tricky to widen as it’s all worked out proportionally. If you want it wider than you can get by playing with the gauge, then the pattern motif would need to be reworked proportionally. So you could add to the lace panel and then add stitches proportionally to the stockinette and garter that frames the lace panel. When I worked out the proportions I was trying to keep it a one skein project though I’m sure it would look lovely as a wider scarf/wrap as well. I hope this helped a bit. Let me know if you have any other questions and let me know how it goes. I was thinking just a couple of inches wider but for my first time I will knit it as written. The next ones I knit I will play around with gauge to see what I get. Thanks Jen! Looking forward to seeing your knitting! Have fun. Your pattern is the first I wanted to make too! I’m using Madelintosh in color Tart. I couldn’t get to thelink to reading a chart, so before I get much further in (I’m on row 36), my question: Do I work all rows from right to left or do I work row one right to left and row two (WS) left to right? I’ve been working them all right to left. Ooh, the Madelinetosh yarn will be lovely! In reading the chart, you need to read the odd numbered rows (right side rows) from right to left and then the even numbered rows (wrong side rows) from left to right. I’m so sorry the chart reading link isn’t working. I’ll mention it to the editor. Hopefully she’ll have that up and running asap. Can’t wait to see your scarf! THANKS KIMLEY. I’LL POST WHEN I’M DONE. I happen to be knitting your “first pattern in the first issue of the sock report” and I am loving it! It is such a fun knit that keeps my interest and yet, is not too challenging. Having said that, it looks so dramatic. Just a great scarf! I’m using Fibernymph’s Peacock Blue Sock Yarn. Thanks for a great pattern. Thanks so much Marian! It’s so nice to hear that you’re enjoying the pattern. Let me know if you post a photo somewhere when you’re done. Would love to see it! Why is it that I have more stash than I can knit in a lifetime and yet I never have the right yarn for the project I want to cast on now??? Just discovered seriously competitive yarn shopping at Wolle's Etsy shop http://t.co/7VH0T7V2 You gotta be quick!